MLB Predictions, Vegas Odds & Baseball Picks: Who are the MLB Playoff Contenders? MLB Predictions, Vegas Odds & Baseball Picks: Who are the MLB Playoff Contenders? Analysing the MLB predictions over the past week, the MLB odds and MLB playoff picture seems to be a little clearer. Both the San Diego Padres and the Minnesota Twins have increased their division leads and are putting themselves in solid post-season positions for our upcoming MLB predictions. 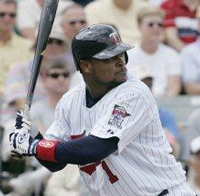 Jim Thome's game winning home run, that beat the Chicago White Sox, enabled the Twins to a four game lead in the AL Central. The San Diego Padres only scored one run yesterday, but it was enough to beat the Chicago Cubs. San Diego now leads San Francisco by five games in the NL West. With roughly 43 games left in the MLB Predictions season, nothing is etched in stone. Many contending teams are very capable of putting together winning streaks. Some notable observations.1). The Atlanta Braves Bats...If the Braves continue their recent spree, they will overtake 5, maybe 6 teams in the NL's Team Batting Standings.they are already ranked #2 in Team Pitching and may vault their way into MLB World Series Prediction favorites. 2.) After getting swept by the Cardinals, and out of first place, the Cincinnati Reds have won four straight games to re-take the lead in the NL Central. 3.) The race for the National League's is a "free for all". In today's MLB Predictions AL games. I Like Texas to rebound with a win over Tampa Bay. The Yankee's will regain first place with a win over Detroit. Minnesota looks like a good pick to defeat the White Sox. Of the AL Bottom Feeder's Division, Take Kansas City and Baltimore for your MLB predicitons. In the National league, Adam Wainwright and the Cardinals are a great pick over Randy Wolf and the Brewers. Cincinnati, San Diego, and Atlanta, all on top of their divisions should be victorious today. The underdog, San Francisco Giants are a good choice to up set the Phillie's in Philadelphia.